- what people WANT the distribution to be. - It IS the case that the top 20% of Americans own 85% of everything; the bottom 40% own basically nothing. 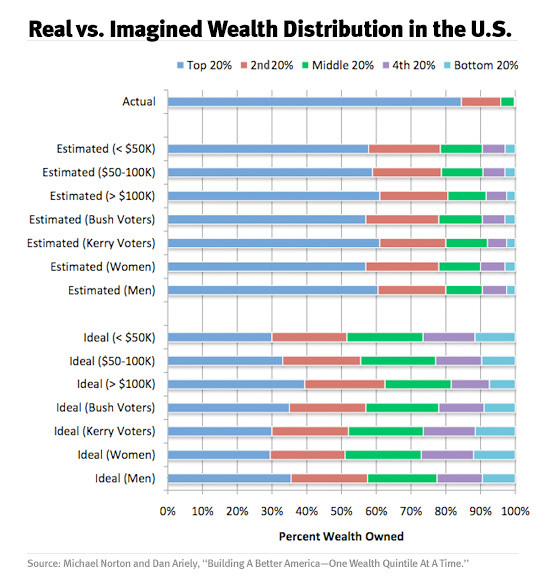 - People THINK that the top 20% own 60% of everything, and that the bottom 40% own at least 10% of the nation's wealth. - People WANT a world in which the top 20% owns 30-35% of everything and the bottom 40% own 20-25% of the nation's wealth. The kicker is that these findings remain remarkably consistent whether you ask men or women, Democrats or Republicans, those earning less than $50K or those earning more than $100K. Rich people have the same egalitarian impulses as everyone else -- and the same ignorance about how far the world differs from those impulses. Submitted by Stephan (not verified) on Sun, 2010-10-10 14:10. The main problem with what you say is in the word "distribution" The stuff was created; so when the top 20% own 85% it's because they organized limited capital to create the wealth that amounts to 85%, the bottom 40% are mostly wage workers or outright parasites of state largess, so you can hardly credit them to having created much. Submitted by Scalping_Elmo on Mon, 2010-10-11 14:27. Capital doesn't "create wealth" out of nothing, at one point that capital was spent on labor, so in fact those bottom rung individuals do far more creating than your average corporate welfare parasite whose greatest contribution to society is the continued cheer-leading of the welfare/warfare state. Which - as it happens - is the prime cause of the wealth disparity in this world. Submitted by billwald on Sun, 2010-10-10 16:57. A guy making ten bucks an hour thinks ten times his wages is rich but numbers that are 100 times or 1000 times his wage are meaningless to him. $250K is upper working class, not rich. Submitted by Jonathan Wilde on Wed, 2010-10-13 22:50. Perhaps "nature" creates one distribution--say, a power law--whereas our minds think in bell curves.